When it comes to grabbing the attention in the world of basketball, very few players do it with the style or panache that LeBron James manages to. We are moving very quickly towards the 2014 NBA Draft but at the moment, the spotlight and attention is falling on James once again and the media are preparing themselves for another period of intense speculation about where LeBron will be playing his basketball next season. This may all sound a bit familiar but when it comes to LeBron James, nothing is unusual. While experts supposedly close to the player believed that James would stay on with Miami and not exercise his right to terminate his contract early, most of the media speculation was that James would take this option. This is not to say that James is definitely leaving Miami; there is a school of thought that he will sign up for another year with the Heat. This means that we have the LeBron James Circus to look forward to again next year but another year of LeBron is more attractive to Heat fans that a year without him. The timing of the decision is perhaps something that has raised a few eyebrows. James didn’t have to declare his intentions this early; he could have waited until the end of the month to make the call. James is not the only player that may be leaving Miami in this manner because Chris Bosh and Dwyane Wade also have the option to terminate their contract early and their deadline is the 30th of June. The summer of 2010 was a pivotal one of the success that the Heat has experienced in the past few years and it may be that the summer of 2014 is equally pivotal. The Heat will be looking to bounce back from a Finals defeat to the Spurs and of course, there was the chance to go for five NBA Finals in a row. Where these three players are playing their basketball in the 2014/15 season may have a huge impact on whether Miami is going to be playing basketball in June 2015. 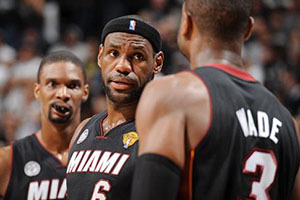 While losing high quality players is a blow to any team, starting again without James, Bosh or Wade provides Heat with the chance to freshen up their pack and rework their roster. If these players exercised the right in their contract to stay with Miami, the Heat would have been coming into the new season with virtually the same line-up as they battled through 2013/14 with. Without the benefit of hindsight, it is impossible to say whether the players are making the right move at the moment or whether the Heat will suffer or benefit from the switch but it certainly adds another exciting element to the world of NBA at the moment. There are NBA Draft betting options to place money on but with James being unable to sign for a new team until the 10th of July, will there be any basketball betting option available for where James will be playing in the upcoming season? This doesn’t seem like a betting option the major sites would miss out on.